Those goals you’ve written for yourself? Screw them up and don’t bother, says Peter Bregman. Well, not quite, but he does think that goal setting can harm your performance. 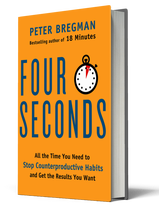 The author of Four Seconds, which is published this month, says that when we feel overwhelmed and stressed by our growing to-do list, our knee-jerk reaction is to work longer hours and pack more into the hours we are already working. Four Seconds is especially handy for entrepreneurs, who are often the bottom line in their organisations, as efficiency is critical. But it’s pretty handy as a navigation tool for everyday interactions too. Taking four seconds to stop and reassess a situation can make the difference between saying the fast and rash thing and falling out with someone, to having a constructive debate. In Four Seconds, Peter cites a study supposedly done at Harvard Business School whereby 3% of students had written down clear goals and ended up being worth ten times the rest of the class combined: “That study never happened,” he says, “Urban myth.” The danger, he says, is that we achieve our “goals” at the expense of what’s important to us. Peter cites a great example of a US football quarterback who was throwing too many interceptions so he was penalised financially. The result? It worked, but only because he threw fewer passes. The fact is most of us shy away from this and we can be our own worst enemies. 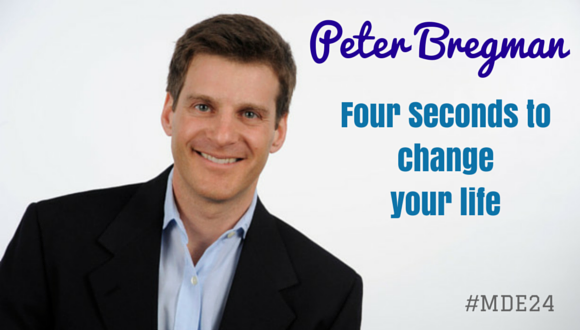 The trick, says Peter, is to keep thinking about the outcome you’re trying to achieve and whether you’re taking the actions because they are familiar to you or because they are driving towards those outcomes. In an entrepreneurial environment the stakes are often sky-high, with personal security at risk as well as professional reputation. And as anyone who's been around the block a few times will tell you, you never know when people will come back into your life in the future. Resisting the urge to burn bridges can be hard, but in the book Peter gives us a blueprint for staying calm and maintaining our integrity. It's a powerful concept, and a book I'm glad to have in my library. I really hope enjoyed the interview with Peter, whether you just read it here or listened to the podcast (and heard all my failures to implement his wise words!). If you have any thoughts or comments about this episode, please do share them with us on Twitter or Facebook – we’d love to hear from you! And finally, if you get a chance I would be hugely grateful if you could leave an honest review for The Mission Driven Entrepreneurs Podcast on iTunes. Ratings and reviews are extremely helpful and greatly appreciated! They're so important to the ranking of the show and I do read every one. If you've left one already, thank you so much! Thanks again to Peter for sharing his story with us.